Nicole Martin was only eight years old when the vampire slaves rose up in rebellion and killed her family. Now she devotes her life to finding a vaccine against vampirism, hoping to wipe out her memories—along with every bloodsucker on the planet. But there’s one thing she cannot destroy: her searing, undeniable attraction for the one man she should hate and fear the most. 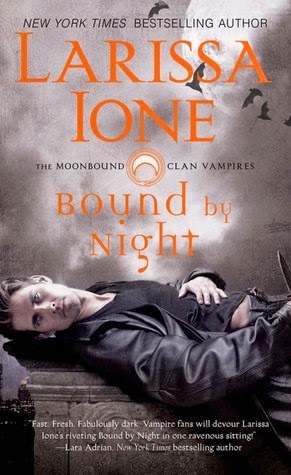 In the alternate reality Larissa Ione has created in Bound by Night, vampires are slaves to humans. They are considered to be dangerous but also lesser beings, more like animals really. An uprising leads to the death of Nicole Martin's family, with her and her half brother as the sole survivors. The Daedalus Corporation, once run by Nicole's father, is dedicated to creating a more subservient race of vampires. When Nicole, now a doctor of vampire physiology, comes of age, she takes over as CEO of the corporation. It is not a job she wanted nor is she equipped for it. Her understanding of exactly what Daedalus does is incomplete at best, but all that is about to change. When kidnapped by the vampire of her nightmares, the man she believed to have killed her beloved nanny, Nicole is terrified, certain she will die. Only, Riker has another plan for her--besides just death. He must save a vampire who had been taken by vampire hunters and sold to the Daedalus Corporation. It is a matter that could mean war for his clan, the MoonBound, if he fails. As it turns out, Nicole knows nothing about the missing vampire. Larissa Ione has crafted an intricate and complex world. I love the way she built on the history of her characters and the world they live in. There is a definite Native American presence in the story, the original vampires being Native Americans themselves. Ione weaves some of those myths and legends into her story while at the same time capturing well the persecution faced by a minority class of people. I liked Nicole instantly and appreciated how the author was able to get across the changes in Nicole's perception of the world around her, including the treatment of the vampires, so naturally. Nicole's entire belief system comes into question, including her thoughts about her own family. Nicole is a smart woman, a scientist, and also one with a big heart. She had been a young child when her parents died and then sent to live with family in France. She had a very limited worldview. Riker hates the Martin family and that includes Nicole. His mate, who had been Nicole's nanny, died because of them, because she was a slave and treated poorly. His heart slowly begins to melt the more he gets to know Nicole, although he has a hard time forgetting what her family stands for and what they have done to vampires. He's very much the warrior type, an alpha male who likes to be in control. His own story is a sad one and definitely shaped who he became. Romance stories involving a prisoner falling in love with his or her keeper can be tricky to tell--and to believe. I admit to not being too big a fan of stories like that. However, the way events play out in this novel, I was able to buy into the story, and I came away thinking Riker and Nicole were a good match. I enjoyed getting to know some of the other characters in the novel, particularly those of the MoonBound Clan. I was not sure what to make of Myne at first, but the more I got to know his character, the more I liked and respected him. Hunter was also a very interesting character as the chief of the clan. I believe he is the subject of the next book in the series, of which we get a hint of towards the end of Bound by Night. Bound by Night is on the darker side. There is a lot of action, with serious themes, and, of course, a good dose of romance. There were moments I felt my suspension of disbelief stretching thin, but overall, I enjoyed it. While I know this book will not appeal to those who do not like vampire stories or fantasy novels, there is much to recommend it. To learn more about Larissa Ione and her books, please visit the author's website. I don't mind reading vampires, but zombies freak me out, lol. This sounds like a good read; with the vampires theme, action and some romance. Glad you enjoyed it, Wendy! A vaccine against vampirism? I am intrigued. Great review, thanks for the recommendation. It sounds interesting! I enjoy many vampire stories, but it takes a good writer to make them believable. This might make a good one for the R.I.P. challenge! I hoped I would like it going in, but wasn't sure. I thought it was a good read though. I'm not really a vampire fan, but of the few I've read, the ones I really liked had a different take on vampires and their relationship with humans. This one looks interesting to me- I might try it out. Jeane - I'd be interested to hear what you think if you do decide to read it. I am not sure how a non-vampire fan will take to it. I did like the different take on the vampire world. It made the book stand out a bit more from others of its kind. This doesn't sound exactly like my cup of tea -- but who knows? The premise sounds intriguing, and I do like zombies. :-) I am also open to vampires as long as they don't sparkle. I normally steer clear of any romance that has a hint of prisoner/guard style romance because if not handled right it can be seriously icky but this sounds like it was handled right and Nicole doesn't come across as particularly helpless. This sounds complex and enjoyable. I'm not normally a vampire fan but this definitely has potential! Katherine - I generally steer clear of them too for the same reason, Katherine. I think the role the vampires played in society was what attracted me to this book despite that though. It's been a long time since I last read a vampire novel. I have heard of this author a lot so glad that you were able to enjoy this book. Athira - I hadn't heard of this author before, at least not that I remember. I am sure I had though as I know she's written a number of books. It's hard to keep track! I am glad I finally got a chance to try her though. Okay so I totally skimmed your review just to see if you enjoyed it or not. Lol! I am really looking forward to beginning this one myself :) Great review! Samantha - I look forward to reading your thoughts on this one! So it has a Stockholm Syndrome thing going on? Glad it was written well because that can go very wrong very easily! This sounds interesting, even though it's not in a genre I typically read. Like you, I'm very skeptical of Stockholm Syndrome romances, but I'm glad to hear that this depiction of one was well done. A.M.B. - Although I don't condone kidnapping, I think it helped that the real bad guy wasn't Riker. I like the sound of Bound by Night. It sounds like the love story between Riker and Nicole worked out well. I'm weary of those type of love stories myself, but sometimes an author can really pull them off well. Naida - I thought it did! They were well matched. this sounds really good, I haven't read a good vampire book for a while. Great review!